The U.S. Central Intelligence Agency says the compound in Pakistan where Osama bin Laden was killed by American commandos on Monday was an active command and control center for al-Qaida, and that bin Laden was not just a strategic or inspirational leader for the terrorist group. A senior intelligence official made the comments at a briefing at the Pentagon Saturday, during which he also released five video clips of bin Laden that were captured during the raid. The official, who spoke on condition of anonymity, says the material gathered by the assault team amounts to the largest trove of information ever captured from a senior terrorist leader. He says there is so much material that officials are still cataloguing it. The official says the material is already providing what he called "some golden nuggets" of information and "important insights" into al-Qaida’s operations. He would not provide specifics, but he said the information indicates that bin Laden was involved in generating ideas for terrorist attacks on the United States and around the world, provided tactical and operational guidance, and directed daily operations. He says bin Laden was not only a figurehead or strategist, as some people had thought. In a written statement, the CIA director, Leon Panetta, said that "further confirms how important it was to go after bin Laden." The official who spoke on condition of anonymity said bin Laden continued to have a particular interest in attacks on transportation facilities and other types of infrastructure, the type of targets al-Qaida has hit in the past. He says bin Laden managed to run his organization through couriers, like the one who unwittingly led U.S. investigators to the compound, which had no telephone or Internet service. One of the released video files, apparently shot during an unguarded moment, shows a gray-bearded bin Laden watching television. He is wearing a black knitted cap and has a brown blanket over his shoulders. He gestures to the camera operator to focus on the television, where he is selecting various channels that are broadcasting some news about himself. The CIA deleted the audio from the video clips. Another clip is a message to the United States, which the intelligence official says includes familiar criticism of U.S. policy and the capitalist economic system. 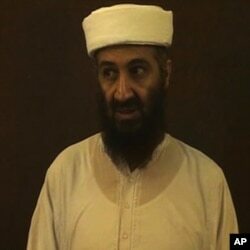 In that clip, the beard is black, indicating, the official says, that bin Laden had dyed it to maintain his public image. The official says bin Laden’s beard was gray when he was killed. The official says that video was recorded late last year, but there are no dates on the other excerpts. The three other clips show rehearsals or outtakes from video messages. The senior U.S. intelligence official says the team also took digital and paper copies of personal correspondence to and from bin Laden. He said such videos and documents would not likely be in the possession of anyone other than bin Laden himself. The official also provided some details about the formal identification of bin Laden’s body after he was killed by the commandos. He says sophisticated facial recognition software provided a 95-percent match from photos of bin Laden. And he reported that two separate analyses of DNA from the body matched the genetic profile gathered from several known bin Laden family members, with what he called only a one in 11.8 quadrillion chance of error. In the American system, a quadrillion is a million billion. The official says a U.S. government team will take some time to go through all the material, looking particularly for information about al-Qaida members, plans and finances. In addition, he says the team is looking for links to other terrorist groups around the world and any information about possible efforts to acquire weapons of mass destruction. He says some of the information is being shared with other countries, but he would not say which ones. The official also said the CIA believes it is significant that in acknowledging bin Laden’s death, al-Qaida did not name a successor. He says that would appear to add credibility to the view that the number-two al-Qaida leader, Ayman Zawahiri, is not popular with all segments of the movement. The American intelligence official described Zawahiri as a controlling, micro-manager who is not charismatic, like bin Laden was. The official called the nearly 10-year effort to find bin Laden perhaps "the greatest intelligence success..of a generation." He said it was based on years of relentless, precision work on the U.S. intelligence community’s top priority.